Nalaka Godahewa has been appointed the new Chairman of the Sri Lanka Insurance Corporation, replacing respected senior business leader Hemaka Amarasuriya. Previously, Godahewa served as the Managing Director of the SLIC. 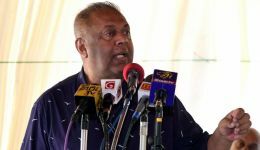 Godahewa’s last position under the President Mahinda Rajapaksa regime was as Chairman of the Securities and Exchange Commission.